This publication first appeared in Tam tam to Internet. It was prepared by L. Van Crowder, William I. Lindley, Wendy Truelove, Jean Pierre Ilboudo and Riccardo Del Castello, Extension, Education and Communication Service, SDRE, FAO. 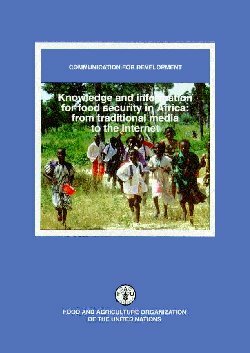 Tam tam to Internet is a 450 page book covering different aspects of communication in Africa, produced by Betam Communications in partnership with Mafube Publishing for the Africa Telecom '98 conference in South Africa. Copies may be obtained from: Mafube Publishing, 91 Central Street, P.O. Box 2185, Houghton 2041, Johannesburg, South Africa; tel. 2711 483 386; fax 2711 728 6437.